The ultimate signature experience is a study abroad program. Having the opportunity to live in another country and soak up a new culture and great food (in Italy anyway) is life changing for most students. In the United States, something is considered old if it dates back 100 or 150 years. That is modern by European standards. In Siena, students attended a horse race that has been run for over 650 years and lived in buildings that were constructed in the 1500s. The Department of Political Science has study abroad programs in London and Siena, Italy. Students typically take six credits (two courses) while they are in the country. The courses include field trips in the city or in other parts of the country. Students have the weekends to travel on their own. Both England and Italy were in the throes of political upheaval with the process of exiting the European Union front and center in the former and the collapse of the government in the latter. With Brexit remaining the political issue in Britain, this year’s London program focused on the array of problems associated with Britain leaving the European Union. Mike Wood, Conservative MP and minister in the newly created, and Brexit necessitated, Department of International Trade, discussed the opportunities for independently negotiating trade agreements for the first time in decades. In the House of Lords, the Liberal Democrats Constitutional Affairs spokesperson, the Lord Paul Tyler, discussed the possibility of a second referendum. 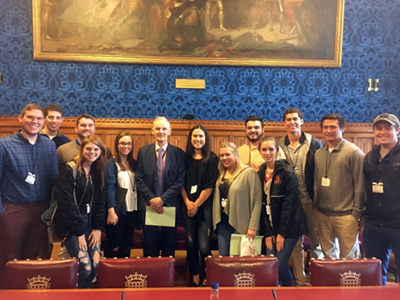 Hywel Williams MP (Plaid Cymru), a member of the House of Commons Brexit Select Committee that oversees the negotiations, acquainted students with Parliament’s role in the process. Aside from the normal excursions and site visits, students also met with Christopher Mullins-Silverstein (Scottish National Party, Whips Office), Francie Molloy MP (Sinn Fein – Ourselves Alone), Martin Le Jeune (Director, Teneo – public affairs firm), Frances Simmons (Constituency Office Manager to the Shadow Foreign Secretary, Emily Thornberry) and James White (Assistant Curate and Deacon, Church of England). For more information, visit the London Summer Program website. For summer 2019, students seeking a longer, more immersive cultural experience, the London Program will now offer optional five-week internships immediately following the normal five-week program. Contact Professor Down (idown@utk.edu) for more information. For the second straight year, Professor Richard Pacelle took political science students to Siena, Italy. Siena, in Tuscany, was the Paris of the 13th century. It was devastated by the plague and never regained its previous eminence. It is a medieval town frozen in time. Its signature event is called the Palio after the banner that the winning neighborhood, or contrada, gets to display and marches through the streets. For those keeping score at home, Drago (the Dragon) was the winning contrada. A total of 29 students (16 of which were political science majors) made the trek. The political science students took courses in political theory and art and politics. They visited Florence to see the art; Pisa to see the Leaning Tower and the Field of Miracles; and Orvieto to see a stunning Last Judgment and the caves of Underground Orvieto. The program ended in Rome with tours of the Coliseum and the Vatican and St. Peter’s. In previous years, students have seen the Pope, Attorney General Eric Holder, Chris Meloni (of SVU fame), Sting, or Usher in person. 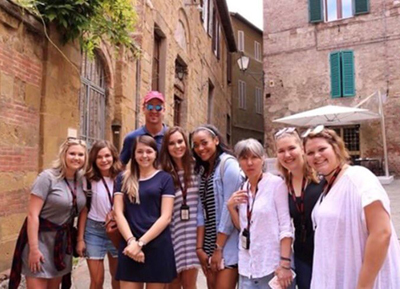 This year’s added bonus was even better – visiting Siena was none other than Peyton Manning who graciously posed for a picture with fellow Vols. For summer 2019, this political science study abroad program is going to move 81 kilometers north to Firenze (or as Americans refer to it, Florence). Florence and Siena are longtime bitter rivals dating back to the 11th century. Florence is the bigger city, the home of fabulous art and Michelangelo (for the art and politics class) and Machiavelli when he was not exiled (for the political theory class) and Dante (just because). We will not be leaving Siena completely. The group will take the hour and 15-minute bus ride to visit Siena to see the Duomo and the 14th century frescoes displaying Good and Bad Government. For more information on the Italy program for 2019, contact Professor Pacelle.